The first Fantastic Beasts movie was excellent. It was a bright and magical adventure. This one is going down another path and I cannot say that I was overly thrilled by that. This movie is putting emphasis on political machinations, division between the wizards and the non-wizards, betrayals etc. etc. Take away the magic component and you really have a fairly regular racial-differences, humans are bad and all that, movie of the kind that Hollywood is all too eager to mass produce these days. Sure it is not as blunt, preachy and totally ridiculous as a lot of their creations but still … not the path I wanted these movies to take. At least there are plenty of magic and beasts around in this movie to make the dark and, at times, boring story a bit more compelling. The magic and the beasts, i.e. the special effects, are really the most enjoyable part of this movie. I was not too keen about Newt already in the first movie and he is not any better in this one. He is simply too nerdy and insecure for my taste. I prefer main protagonists that are more assertive and active. Having said that he is still a likable chap in general. Queenie is still annoying as hell though. I was very positively surprised by Johnny Depp as Grindelwald though. I was not at all sure that his normal half crazy and comical acting style would make for a good main bad guy. However, he worked very well in the role. The end is pretty much a big cliffhanger and not exactly on a good note. This is actually a fairly sad movie overall which is perhaps one reason that I, personally, did not feel overly impressed by it. That is not too say that it is not a good movie. It is just that is is not the kind of story I hoped for. First of all, just like in the last movie the acting in this film is excellent but with a few exceptions. Eddie Redmayne was still excellent as Newt but I think he did a better job in the first film. Same thing with Dan Fogler who didn’t seem as funny but useless and could have just been written out of this film. But I did really like Jude Law as a young Dumbledore and Joshua Shea who plays young Newt. Joshua played younger Newt so well that he actually looked like a younger version of Eddie. Jude Law brought the same kind of attitude towards Dumbledore that we all know and love. The special effects and set designs still looked marvellous. The creatures special effects just like last time were great and looked like if we saw them in real life that’s what they would look like. The sets looked directly like they got taken directly out of a history book. Now with this film being a sequel, you would think they would fix the problems they had in the last film but for this one, they didn‘t. The main thing that bugged me was Johnny Depp. He didn’t do a good job of playing the main villain. It could be because of the writing or just because of his acting. Next is all of the subplots. I counted there are around four of them. But seeing how I couldn’t really figure out the main plot one of those subplots could have been the main plot. The last thing is the pacing in this film. Some scenes just seemed like the plot stopped for this one scene that could have just been taken out. The entire film felt really slow and only in the action scenes did it seem to pick up. At least the music was good. In the end, Fantastic Beasts: The Crimes of Grindelwald just seemed like a cash grab film. I give Fantastic Beasts: The Crimes of Grindelwald a 5.5/10. 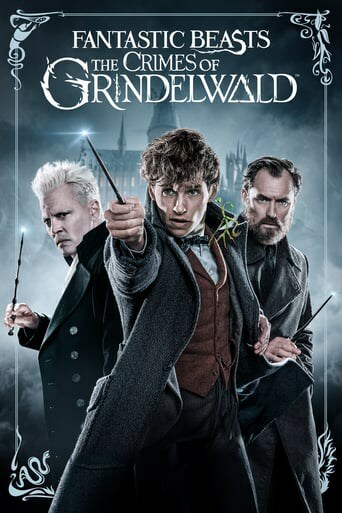 Downloading Seeding Fantastic Beasts The Crimes Of Grindelwald (2018) [WEBRip] [1080p] [YTS.AM] from to 0 peers.